All of our corn and soybean acres have been 100% no-till since 2010. No-till practices reduce soil erosion, increase water infiltration, and improve soil aggregation. By not tilling the ground every year we are not disturbing the natural soil biology and living organism that improve the soil structure. Earthworms are our tillage tools! Recently we have taken our no-till practices to the next level and integrated cover crops into our system. 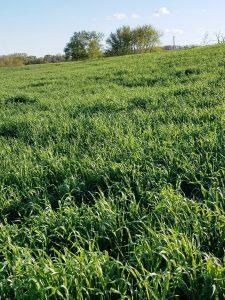 Cover crops have allowed us to further decrease erosion, build organic matter, decrease weed pressure, and extend our grazing season for the cattle. We believe this to only be the tip of the iceberg on what benefits using cover crops provide. Does this sound like something you would like to see done on your farm? We are always looking to expand our crop acres. Contact us today to see how we can better the future of your farm!